The National Snow and Ice Data Center (NSIDC) reported last week that the Arctic sea ice melt season had gained momentum in May following a slow start. (The rate of decline in April was the third slowest on record.) 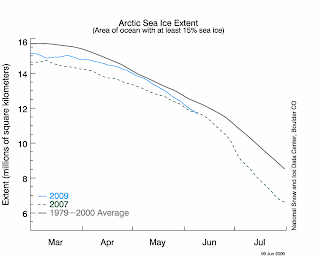 The latest chart of sea ice extent now shows that the current measurement exceeds even the record-setting pace of 2007. As Herr Hare points out, however, that hasn't stopped the denialists from declaring the exact opposite. Global Warming Doesn't Make Sense? In an infinite world of Googling Monkeys, all forms of BS (Blog Science) should be equally likely, but anti-gravity blogs are far fewer than anti-global-warming blogs. Why is that the case? New Scientist magazine points out "Seven things that don't make sense about gravity". Maybe the anti-gravity true believers have all taken a long walk on a short pier. The all-time June daily record is 10.67" on June 21, 1972. As of Tuesday's total, Washington National was already above the long-term average for the entire month of June. Wednesday's amount at Dulles was a new daily record for June 10, exceeding the 0.83" in 1963, the year the airport first opened. The year-to-date total at Dulles of 25.21" is now ahead of last year's near-record pace and nearly 40% above average. 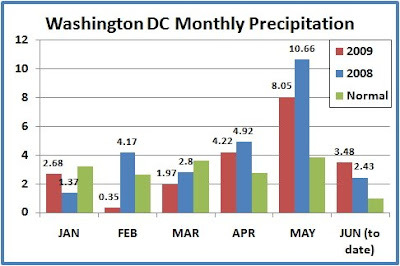 Despite a droughty debut, the year is now 3.73" above average at Washington National. For the first month since January, June's total is now running over an inch above 2008's near-record rainfall rate. FAR THIS MONTH AND YEAR. AIRPORTS 80 WAS SET IN 1980.